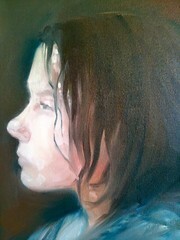 A new work, a portrait in oils of my daughter. In this afternoon session, I established much of the white on dark composition. Tomorrow, I will add touches of color, both in the face and background. 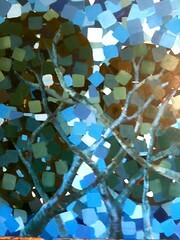 The next layers in my new painting in my Geometric Trees series have been applied. Many more to go! Each layers considerations of color, and composition, and relationships, but also technically each layer gets a new medium, with a slightly different ‘fatness’.